More snow had fallen on the river since last report bringing about 4-6″ of fresh powder to the zone. It is still hard to walk around here once the snow softens especially around the sage brush bush wells. A lot of snow has receded from the banks and is exposing more shoreline and the dead wild grass from the fall. 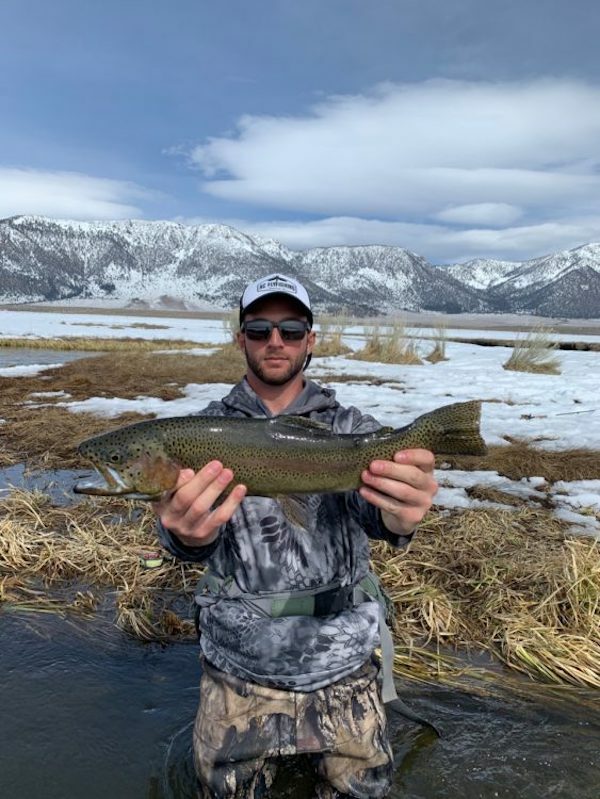 River flows have increased to 97 cfs but the water clarity remains good and the fish are still holding in their usual areas. You may have to cover some ground again to get into the numbers. 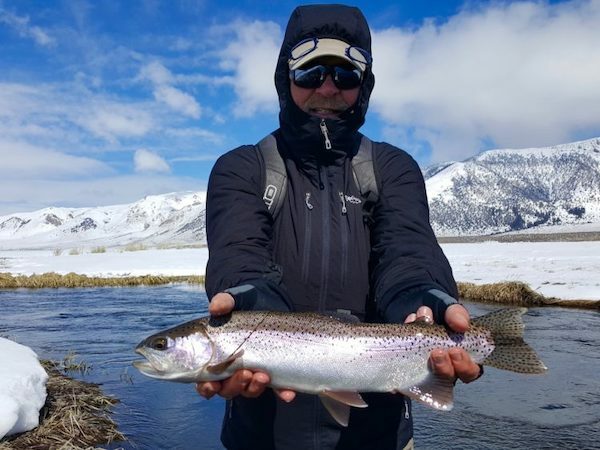 The BWO hatch is happening mid-day and this month we may get a shot at casting dry flies to fish over 20″ again. 6mm Otter Eggs in Tangerine Opaque, Kiwi Flash, Dead Egg, and Apricot, #14-16 San Juan worm red and Bead San Juan Worm red, #14-16 Level Crystal Leeches, #14-16 Parallel Assassin Dark and Light, and #16 Broken Back Copper Tiger Midge are lighting up the fish! 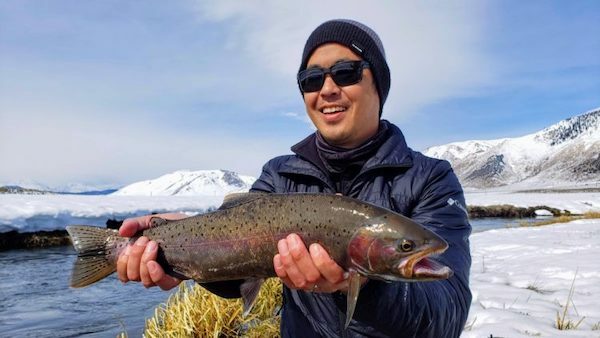 Jason Toy worked for this one in some challenging conditions! 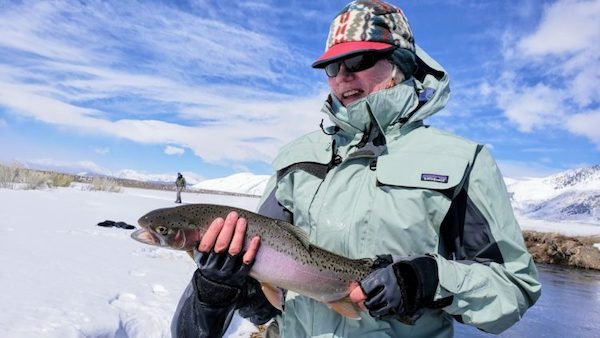 Debbie Sharpton of the Sierra Pacific Fly Fishers had the itch to catch some snowbows. She landed a couple of beauties! 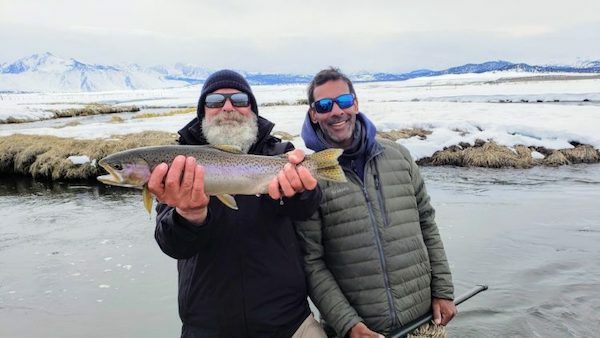 Ernie Roberts took his friend’s recommendation to fish with me and got his trophies! 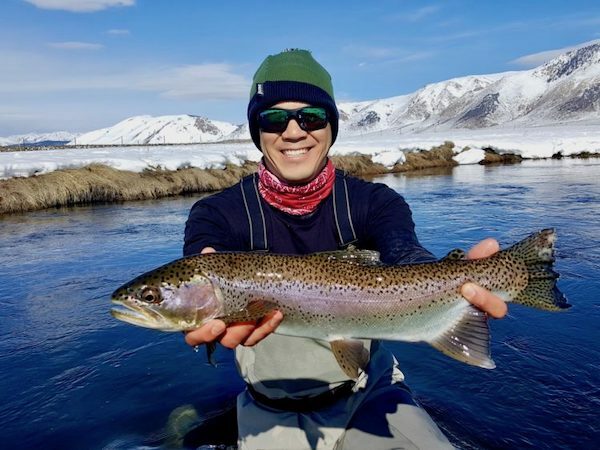 TJ Yee battled some fierce winds and landed this chunky rainbow. 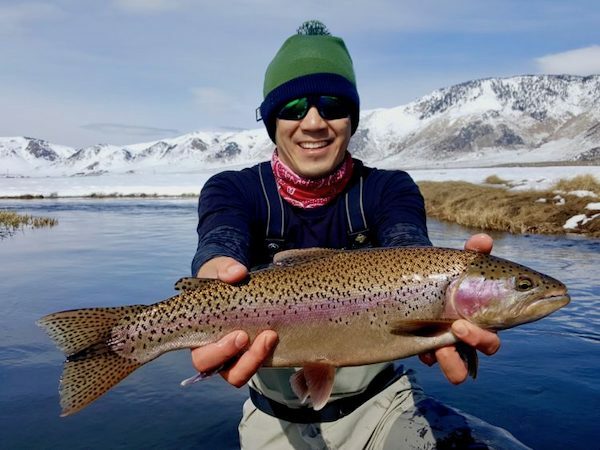 Chad Shimazaki fished with Doug Dolan and got a perfect specimen! Elijah Roth fished with Hans and got a tank with a massive head! 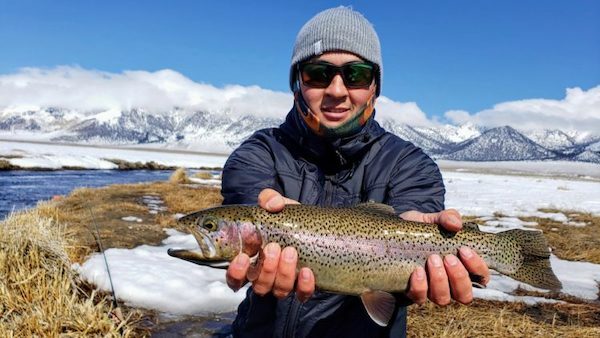 Kevin Rainbolt hammered this stellar fish during a cold and windy day! 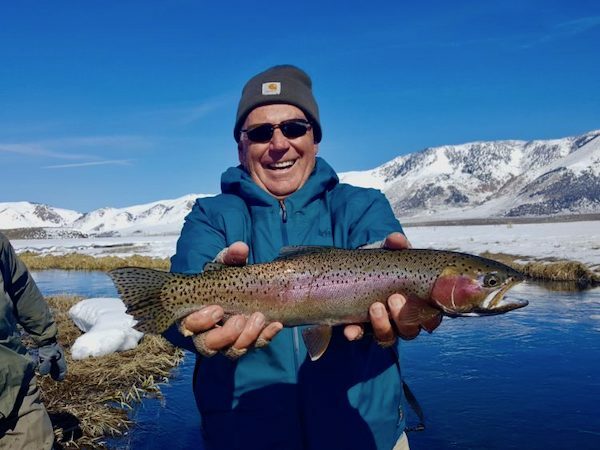 Tony Smith got in on the action with Two Bug Doug too! 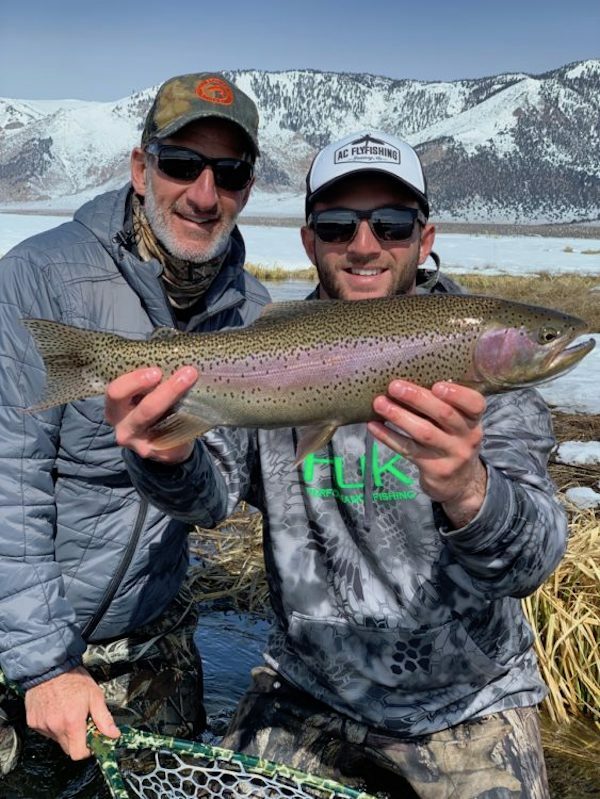 Charlie Campisi got a nice one on a perfect day on the river! 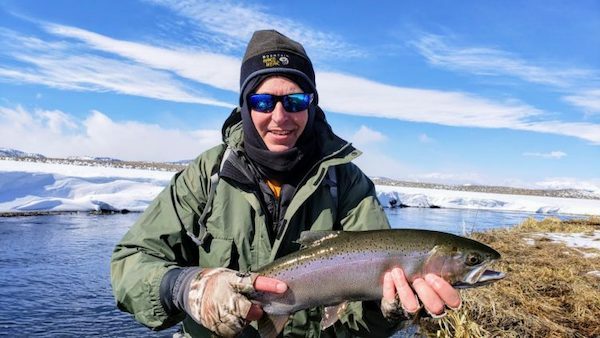 Chad with another prized fish! Here’s Elijah with his dad holding a nice one! 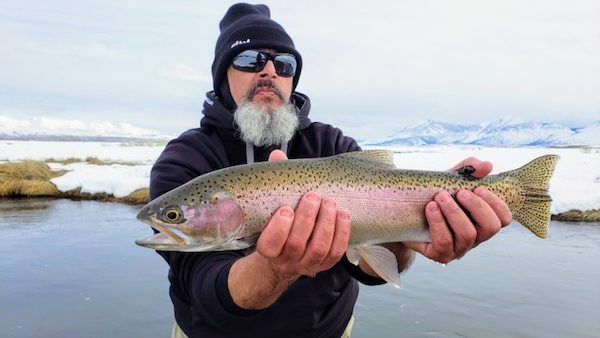 John Bosowski has fished with us before and wanted to get on the river with Two Bug for some big ‘bows! 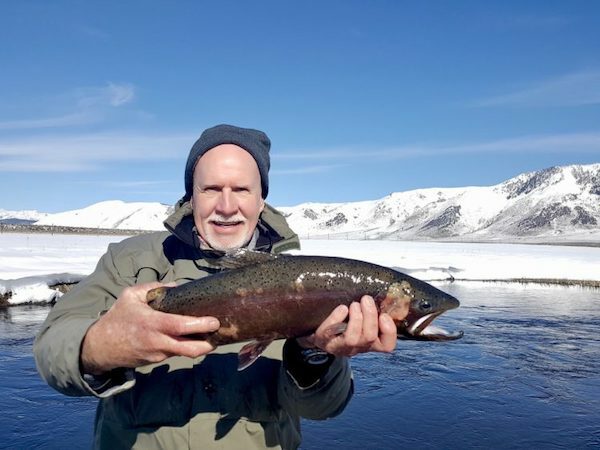 Dave Simcox fished with Doug Dolan and bested this beauty!